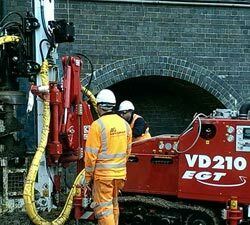 We can offer you a complete piling solution, supported by our in-house design capability selecting from our capabilities in CFA, Rotary and Mini Augered Piling. With our experienced management team and fully trained & highly motivated work force we ensure each team member makes a unique and significant contribution to your project. We install Secant Walls, Contiguous walls, CFA bearing piles using Tes Car, MDT, Soilmec, Casagrangde and Hutte rigs. Hollow stem bored piles are constructed with sectional hollow stemmed augers, once the design depth has been reached concrete / grout is pumped through the centre of the augers to base of the pile, the augers are then extracted whilst the concreting / grouting continues to ground level, reinforcement is introduced completing the pile. This method of piling alleviates any issues with unstable bores and water strikes as the bore is permanent supported by the augers throughout construction. Steel cased bottom driven piles are formed using a circular steel casing with a crimped (pointed) toe. These casings are driven into the ground to a “SET” using an integral weight which is repeatedly dropped a pre-determined distance. The energy is transferred from the weight through a dry mix concrete plug in the base of the pile, and into the outer steel casing which propels the casing through the surrounding soil. The Casings are connected together by forming a continuous water tight fillet weld around sections. 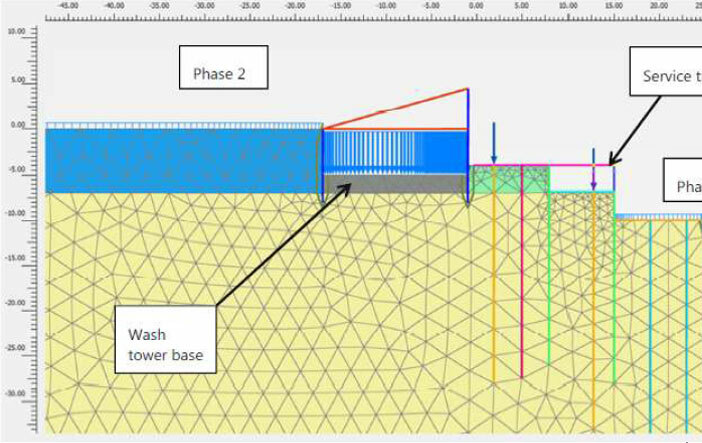 Contiguous piled retaining walls are formed using either Rotary or CFA piling technics, piles are installed at close centres, with typically 100-200mm gaps between piles. These piles form temporary or permanent support to excavations. 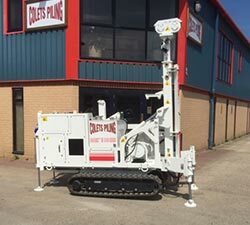 This technique is suitable for basements, underground structures and motorway cuttings where working space is limited or adjacent to existing structures. Secant piled retaining walls are formed using either Rotary or CFA piling technics, unreinforced female piles are installed at close centres using a slow-gain (soft) concrete mix, after a sufficient curing period and once each alternate pile has been installed, the reinforced male piles are installed using a standard concrete mix. The overlap for a typical secant section is approximately 75 – 100mm which ensures that water ingress is minimised and fines wash-out is prevented. The interlocking secant wall is not watertight; however water flow is greatly reduced. These piles form temporary or permanent support to excavations. 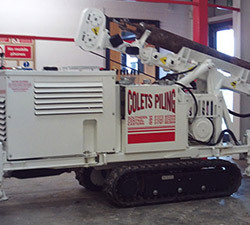 This technique is suitable for basements, underground structures and motorway cuttings where working space is limited or adjacent to existing structures. Our construction managers can advise on attendances, access requirements and contract sequencing. They will also provide health and safety documentation, generic versions of which can be found on our website. 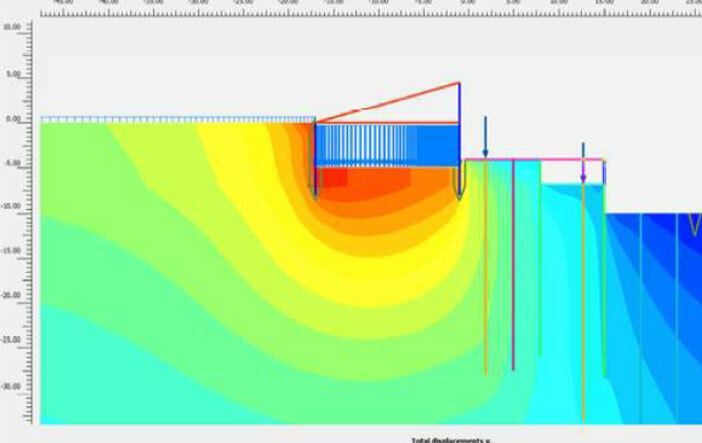 Our in-house design team has extensive experience in developing robust and economical proposals for foundation piles and piled retaining walls by employing current state of art numerical approaches. We provide design for the piling platform required to support our piling rigs. To ensure the stability of construction plant a stable working surface is required which will not settle excessively under the weight and working pressures of the piling equipment. This generally takes the form of a compacted crushed granular material and in some instances, geotextiles may be for a more cost effective solution. Designs are based on and comparable to BR470.